Below is a table comparing some of the main features of the Minox 8x43 HG binoculars with one of the best 42mm binocular that money can buy the Swarovski 8.5x42 EL and the Leica 8x42 Ultravid HD Binoculars. So as you can see all three binoculars have their strong and weak points. Strong points for the Minox is it's incredibly low weight and in comparison to other high grade optics relatively low cost. It's field of view does fall a little short when compared to some of the best like the Swarovski's and the Leica's above, but is still pretty good and should be fine for most people. Highlights include the fully multicoated optics and the phase correction coatings on the prisms that do help to produce the very bright and sharp image that is as good as any binocular that I have tested in this class and in my experience you usually have to spend a great deal more money than this to find a brighter binocular. I also really like the distance scale on the focusing wheel that with that turns your binoculars into a kind of short distance rangefinder. The quality of the metal wheel as well as the focusing ring that locks in place are also just a few of the quality components that all come together to ensure that you feel that you have a quality pair of optics in your hands. Considering that these binoculars are around half of the price of something like a Swarovski 8.5x42 or a Leica 8x42 Ultravid HD, I would say that these make incredible value for money. One feature that is missing from these is ED (Extra Low Dispersion) glass that you will find on optics like the Swarovski's, but does this make the Swarovski's twice as good? I personally don't think so. Don't get me wrong, if money is no object, you cannot beat something like a very top of the range Swarovski binocular. But if you are looking for a very high spec binocular and don't want to spend the $2000/�1500+ it takes to get something like a Swarovski, then I highly recommend the Minox 8x43 HG. It is a great binocular at an excellent price that almost anyone would be proud to own. They make ideal general use binoculars that will excel in nature observation and as birdwatching binoculars. They are also great optics for hunting due to their rugged design and neutral coloring. They very tactile armour covering feels great in your hands, are very lightweight in comparison to other high quality full size binoculars and are well balanced. Weak points? It is a small thing and I am probably being over picky, but I guess it would have been nicer if they had a slightly wider field of view. 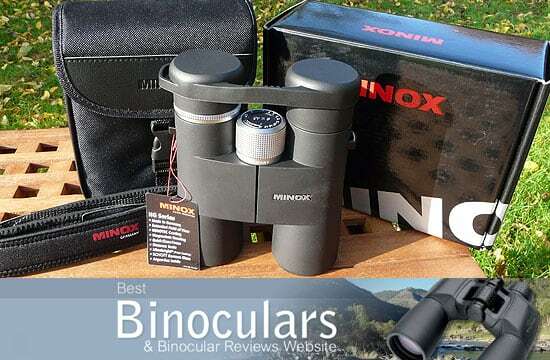 I would like to thank Minox Germany for providing me with these Minox HG-Line Binoculars to review. Large objective lenses and 8.5x magnification makes these Eschenbach's ideal birding binoculars and great for wildlife observation. 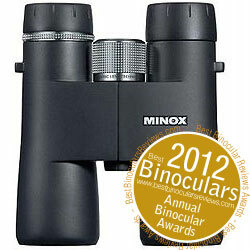 Discount Binoculars: These Minox HG Binoculars are available at a discount on Eagle Optics and Binoculars.com in the US.